“Klapa songs are not like the “Rolling Stones” songs, they are limited to the intimacy of the expression of love and lyrical songs and they do not desire for everyone to listen to it. These are the emotions that you cannot reveal to just anyone ..” – maestro Duško Tambača. Klapa music is a form of traditional (folk) a’cappella singing in Dalmatia, Croatia. The word klapa translates as “a group of friends” and traces its roots to littoral church singing. The motifs in general celebrate love, homeland and sea. Main elements of the music are harmony and melody, with rhythm being less important. In 2012 Klapa music was inscribed in UNESCO Intangible Cultural Heritage of Humanity. 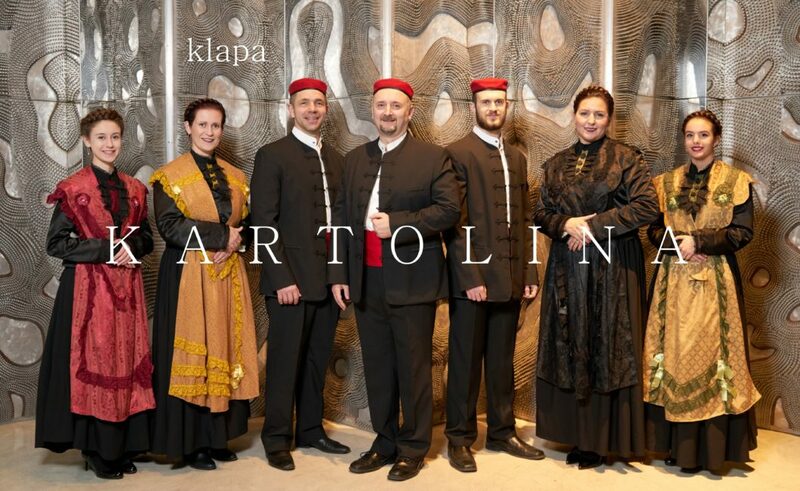 Klapa Kartolina is a registered non-profit organization dedicated to promotion of Klapa singing and Croatian culture. Klapa Kartolina are (from left to right); Gabriela, Višnja, Frank, Zoran, Dominik, Bernardica and Daniela.